Share the pleasure with any chocolate-lover as they open into our traditional 15-piece assortment with luscious pralines, subtle ganaches and solid chocolates, completed by 3 of our famous Z chocolates. A 'safe bet' assortment that will please anyone who likes chocolate! It came in a finely wrapped and packed big silver box. Inside the package was a black canvas bag with zChocolat.com’s logo and a card in white that said "Votre Message" (Your Message), as well as a booklet that described filled chocolates made by zChocolat. Inside the canvas bag is a black thick self printed Cardboard box with a logo of Zchoclate being sticked in white color. It’s a simple, but elegant and well made box. 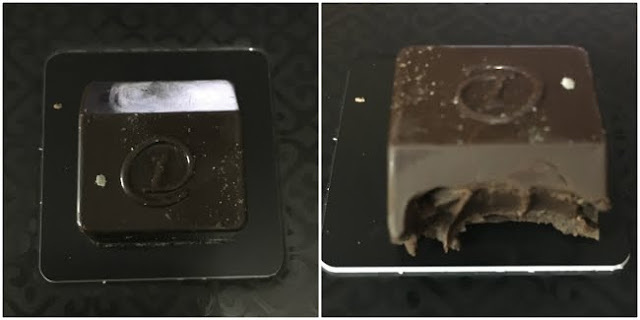 Carefully places inside the black box is an individual black and golden box that contains 15 chocolates. 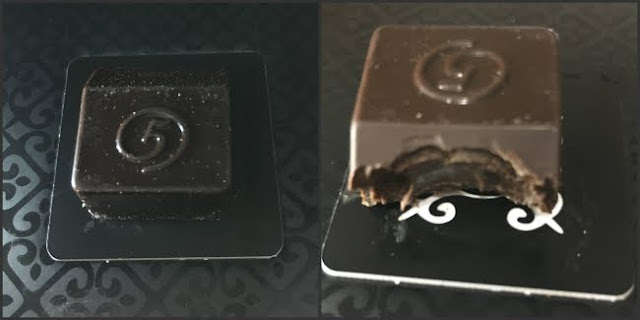 Each chocalte have their unique identifying number engraved on the top, making the flavour easy to pick out from the little book that’s included. 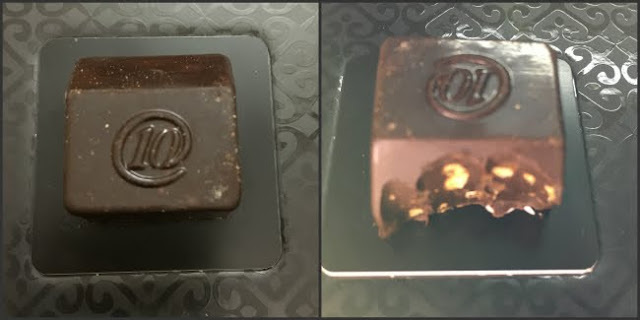 They are numbereed from 0 - 11 and 3 choclates are marked "Z"
Z – One of the best filled chocolates that I have EVER tasted! It came in two flavours: white and dark. 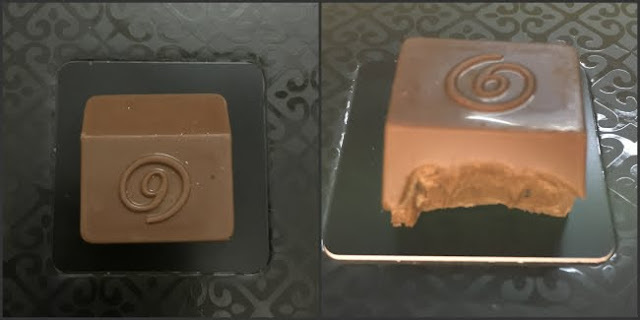 It has a creamy layer of "runny" caramel with slightest salty flavour. The combination in your mouth is unbelievable I liked the dark out of the 2 "Z" chocolate. 0 – made with roasted hazelnut and surrounded by milk chocolate and filled with crunchy bits of almond. Slow roasted hazelnuts is the way to go. 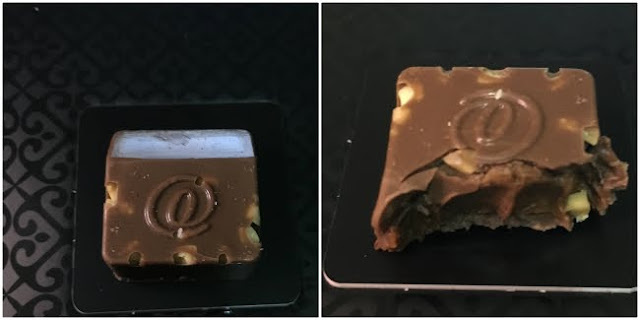 This chocolate was divine and the California almonds really add a wonderful flavour. 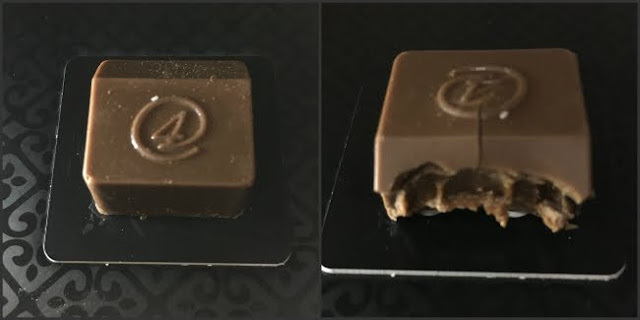 1 – A Madagascar Bourbon vanilla ganache infused with lavender essence covered witg Venezuelan dark chocolate. I don’t like lavender in chocolate. 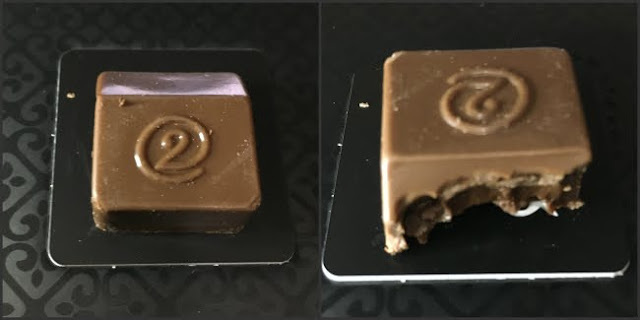 The ganache was smooth and creamy and rich and dark but the lavendar made it taste more like some lavender sceneted perfume. 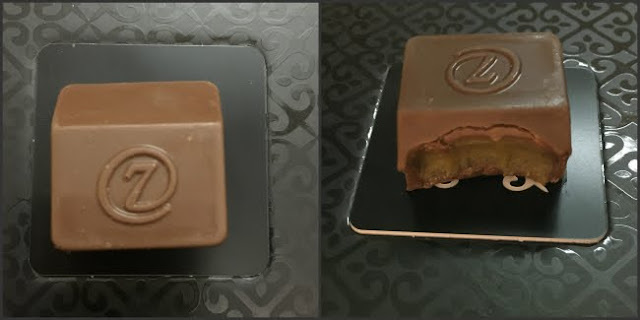 2- An Italian Gianduja praline made with hazelnut and dark chocolate and covered in 40% Ivory Coast milk chocolate. I loved the creamy layer in the bottom and crunchy layer on top. 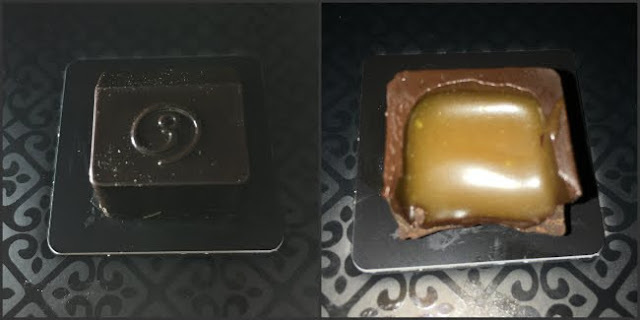 3 - Rich smooth Caramel mixed with tangy passion fruit, coconut and mango puree nd covered in a Venezuelan 70% dark chocolate. The centre was like a creamy caramel, with a overwhelming tangy orang flavoured caramel the flavor of coconut cannot be feel. I did not like it much! 4 - A Valencia almond and peanut praline surrounded in 40% Ivory Coast milk chocolate. I like nuts in my choclare This was the closest to a peanut butter-flavoured chocolate with a hint of roasted almonds and all perfectly paired with milk chocolate. 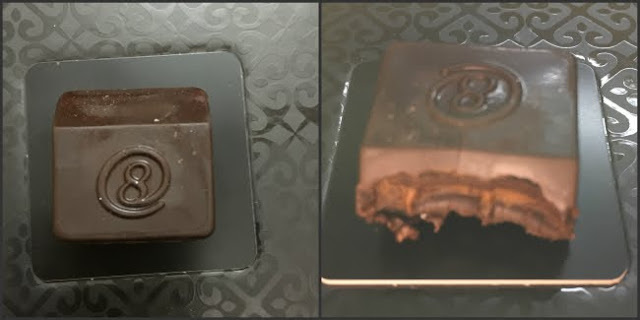 5 - A deeply flavored rich dark chocolate ganache covered in a Venezuelan 70% dark chocolate. This was dark and rich tasting – just the way I like ganache. 6 - A praline made from slow-roasted Valencia almonds and rich ivory coast milk chocolate with minced almond. A slow-roasted nut flavour full of smokiness. 7 - Coarsely minced sweet and salty Iranian Pistachios blended with a creamy Pistachio-almond pasted and surrounded in milk chocolate. It full of bitter almond extract that flavor of Pistachios cannot be feel. 8 - Finely ground caramelized hazelnuts and smooth coffee ganache covered in dark chocolate. That deep smoky roasted almond flavour went very well with the strong coffee flavour, leaving me satisfied and yet wanting more. 9 - A slow-roasted Valencia almond caramalized and grounded into a fine powder mixed with milk choclate and pur coca butter. SOOOO GOOD! the rosted almond flavour with the finely roasted beans made the entire chocolate heavnly. 10 - Solid Venezuelan 70% dark chocolate with minced pieces of almonds from the Valencia region of Spain. Totally my kinda flavour as i prefer nuts in my chocolates but it was the hardest of all the chocolates. 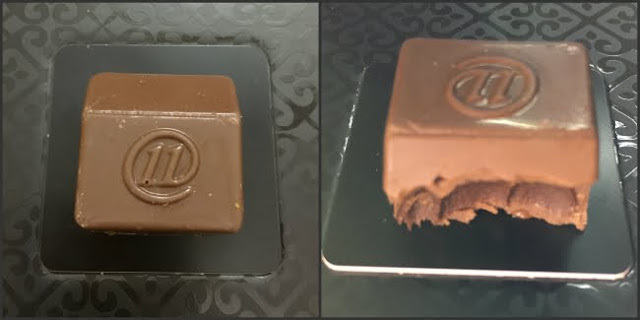 11 - A bite-sized version of molten chocolate base with raspberry coulis. Exactly like the description. No seeds! Very, very yummy. 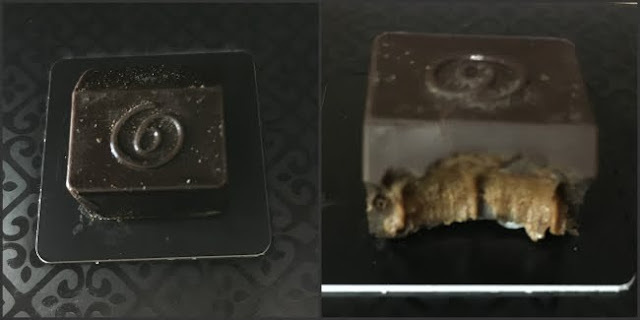 I have to admit that their presentation and attention to detail won me over before I even began to taste the chocolate. Oh my, these look incredible - even the packaging looks luxurious! I think my favourite would be either 3 or 9! This is just so wow! It made me crave for chocolates and my mouth is watering right now :) I hope they'll send me one too. haha..
Oh wow they look so yummy!! :) I love white chocolate! Not a brand I've heard of before but they look delicious. These look so good! The packaging is beautiful, and I like how the chocolates are numbered so you can easily work out which is which. emmmm they look yum yum. what a yummy post... Seriously mouth watering.... Lucky you :P btw im also a dark chocolate fan preferably sugar free.